The federal trial of sports agent Bartolo Hernandez and baseball trainer Julio Estrada is hitting the home stretch. On Tuesday, their defense attorneys called five witnesses, including two executives from the Texas Rangers and one from the Miami Marlins, hoping their testimony would help punch holes in the federal government’s case against Hernandez and Estrada. The two Florida men are accused of conspiring with a ruthlessly violent ring of human smugglers who specialized in ferrying more than two dozen baseball players out of Cuba for a cut of their lucrative Major League Baseball contracts. Their client roster included José Abreu, Yoenis Céspedes, Adeiny Hechavarria, Dalier Hinojosa, Leonys Martín and Jorge Soler. 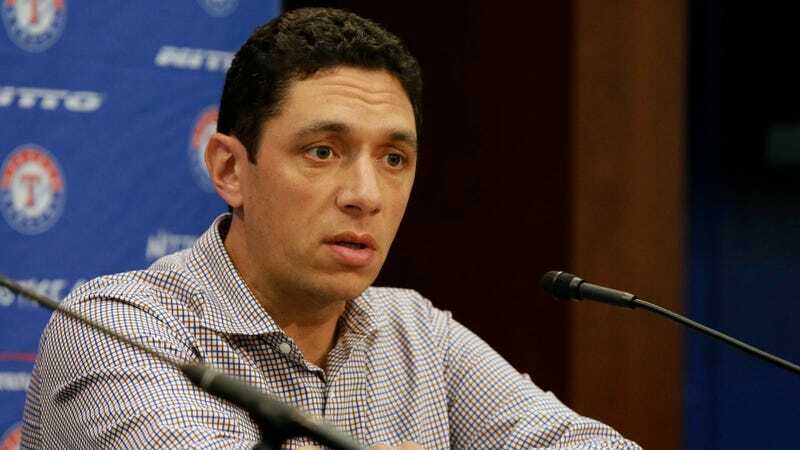 Under questioning by Hernandez defense attorney Daniel Rashbaum, Rangers general manager Jon Daniels said he had no clue that Martín, whom the team traded to Seattle in 2015, planned to cross the U.S.-Mexico border illegally on Apr. 2, 2011. Later that evening, Daniels had emailed Martín’s other agent, whom Hernandez worked with, a letter of agreement between the Rangers and the Cuban outfielder, according to a copy shown to the jurors. “No I was not,” Daniels said when asked if he was aware Martin was crossing the Mexican border on the same day he emailed the agreement. He also denied having any discussions with Martín’s representatives about the Rangers still honoring the agreement if the player entered the country illegally. “No I did not,” Daniels said. Daniels and Daly were the first witnesses called to testify for the defense after federal prosecutors rested their case. Hernandez’s lawyers also called Marc Lippman, the Marlins’ assistant director for player development and international relations, who testified about the team’s efforts to help Hinojosa obtain a tourist visa in August 2013 so the pitcher could participate in a scouting and evaluation session. Hinojosa ended up signing with the Philadelphia Phillies. Over the last four weeks, the government called former members of the smuggling ring, federal agents and some of the star players, including Abreu, Hechavarria, and Martín, who provided detailed accounts of a criminal enterprise that criss-crossed Florida, Cuba, Hispaniola, and Mexico. For instance, government witness Alexei Cruz testified that he handled the logistics of getting players out of Cuba and onto boats in the open sea that took them to other countries. He testified that he and another smuggler, Eliezer Lazo, worked directly with Hernandez. Cruz also said he partnered with Estrada to smuggle more than half a dozen baseball players out of Cuba, including Abreu, Hinojosa, and Soler. During Cruz’s testimony, Sullivan showed images of bank transfers and checks from Estrada’s company to Cruz’s company between 2012 and 2015, totaling more than $1.5 million. Cruz testified that the payments were for his role in smuggling Cuban players. The ring took advantage of Major League Baseball’s rule that Cuban baseball players had to establish residency in another country in order for teams to sign them as free agents, according to prosecutors. Players have to prove they no longer reside in Cuba because of restrictions under the U.S. economic embargo against the communist nation. Sullivan and his co-counsel, Assistant U.S. Attorney Ron Davidson, are trying to establish that Hernandez and Estrada participated in the conspiracy by identifying players who wanted to be smuggled out of Cuba, helping them obtain fraudulent travel documents, and paying their smuggling fees and living expenses in the other countries. Their lawyers deny Hernandez and Estrada had any involvement with human smuggling, and claim their clients only got involved with the players after they had defected. At times, the testimony has evoked scenes that would be at home on the pages of a Carl Hiaasen novel. Los Angeles Dodgers pitcher Reinier Roibal testified that the ring’s original leader, Joan “Nacho” Garcia, introduced him to Hernandez in Cancun, Mexico, in 2009 shortly after his escape from Cuba. Later that year, Roibal testified, he was sitting in the front seat of a car in a Cancun boatyard when unknown men approached the car and shot Garcia to death. “After hearing the gunshots... I turned around and could see what was happening,” Roibal said. Hechavarria, a shortstop for the Miami Marlins, testified that he lied to FBI agents when he told them he didn’t know Lazo, who took over the operation after Garcia was murdered. Lazo was sentenced in 2014 to 14 years and six months in prison for his lead role in transporting more than 1,000 Cubans off the island, including the baseball players, who often had to pay substantially more than the standard $10,000 fee per passenger. At the time of his sentencing, Lazo was already serving five years for money laundering in a Medicaid fraud scheme. Martin told jurors he crossed the U.S.-Mexico border without any valid immigration documents because he feared being kidnapped or killed after “eight or nine” men attempted to take him in Cancun. “My life was in danger in Mexico,” Martin testified. “My safety was at risk.” And last week, Abreu recounted how he ate his fake Haitian passport while downing a beer during his flight to illegally enter the U.S. in 2013. Today, the defense will call Allard Baird, Boston’s senior vice president for player personnel, and Scott Shapiro, principal of Praver Shapiro Sports Management. Rashbaum said Hernandez may take the stand on Friday.